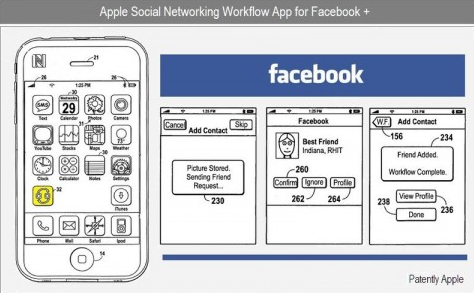 Apple has submitted a patent to integrate the Facebook application into the iPhone as a native application, instead of a 3rd party application. The patent specifically show how to add a contact as a Facebook friend. You can begin by connecting to Facebook and sending a friend request to one of your contacts (target device). Your device could also read the vCard to generate this friend request. Once you have confirmed the steps then the receiving device could receive the message as a set of instructions which will allow the contact to goto Facebook and confirm the friend request.